Former Schalke forward Chinedu Obasi has left English Premier League side Sunderland after manager Sam Allardyce decided not to offer him a contract. The 29-year-old Nigeria international was released by the Bundesliga club in the summer after making just 10 league starts in three years. "Obasi had a relatively successful trial but for obvious reasons the club wants someone who can make an immediate impact," a source close to the player has told BBC Sport. The free agent, who has 18 caps for Nigeria and holds a German passport, has returned to Germany and is now exploring other options. "There are some interested clubs from the English Championship because he has a lovely CV for a free player. "He showed his creativity by scoring goals during his Sunderland spell, a strong indication that he will be playing football at the top level sooner rather than later." 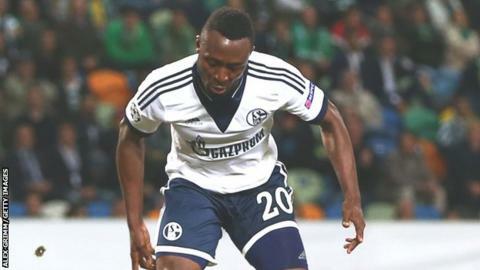 In his three years with Schalke, Obasi scored just four goals in 34 games in all competitions. He was signed by Schalke after a brief loan spell in 2012, having scored 25 goals in 91 Bundesliga appearances for German rivals Hoffenheim. The striker previously played for Norwegian top division side Lyn before moving to Hoffenheim in 2007. Obasi appeared in Nigeria's three group matches at the 2010 World Cup in South Africa. He is the only Nigerian to have appeared in all Fifa World Cups [Under 17, Under 20 and Senior] as well as the Olympics.